"Free to squeeze what we damn well please!" In a stunning surprise announcement yesterday, the National Rifle Association (NRA) revealed that it is a clandestine organization for closeted gay people so intent on concealing their sexual orientation they have espoused a bogus philosophy regarding guns popularly believed to be "manly." The NRA has in effect since its founding been the world's largest beard, serving to conceal the sexual preferences of its now more than 4 million members. "But no more!" 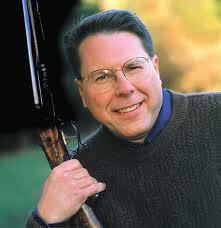 proclaimed NRA Executive Vice President Wayne LaPierre to a cheering throng at the group's annual convention yesterday. "We are free to squeeze what we damn well please, and it isn't the trigger any more!" Mr. LaPierre explained that recent declarations by Anderson Cooper and others had prompted all 4.3 million NRA members to come out of their very large collective closet. "Most importantly," stated LaPierre, "we're sickened at how all so many of you believe the ridiculous nonsense we've been forced to spew about guns all these years! 'Guns don't kill people, people kill people?!!' That's about as credible as 'your check is in the mail,' 'I was just about to call you,' and 'I won't ... actually that third one doesn't need to be credible, even better if it's not!" The NRA will now work vigorously towards implementing sane gun laws throughout the country, although a small splinter group of dissenting NRA members calling themselves the GGNA (Gay Gun Nuts of America) has also formed. Both President Obama and Governor Romney voiced support for the NRA's action, although Mr. Romney indicated regret that he may have blown possible prior opportunities to hold down Wayne LaPierre and cut his hair. "I see no reason for any change in the gun laws," said Governor Romney, "but will reserve judgment until I meet with the GGNA as to whether they should be further watered down." President Obama indicated that he would now strongly support sane and reasonable gun laws, most specifically a ban on semi-automatic assault weapons that come in designer colors, but that he wouldn't have time to get around to it until at least the latter part of 2016 and most likely later.